⟶ View B3's Retail menu here! Let us know your orders! 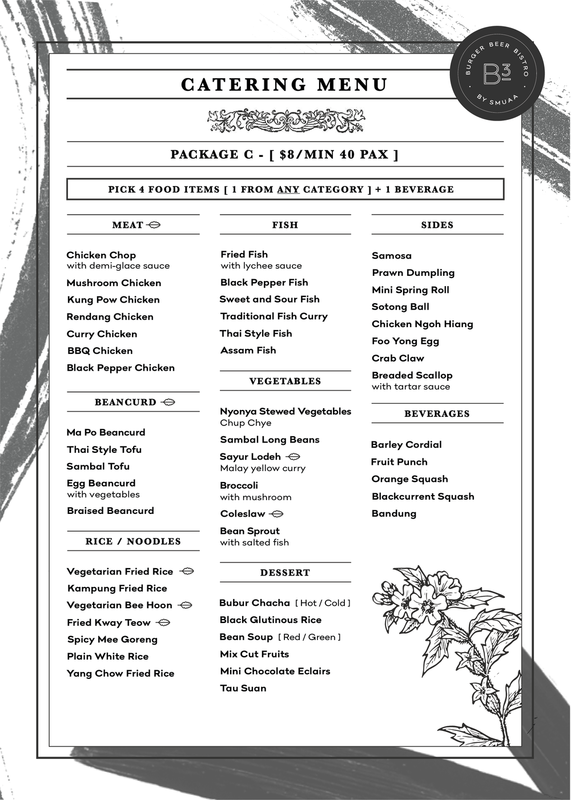 Catering Menu Packages A - D / Tea Time Menu: Order must be placed 10 working days prior to the delivery / self-collection date (unless otherwise stated) • This package is not entitled to further members’ discount or promotion • All prices stated are not inclusive of GST. For Bottled alcohol beverages, order must be made in advance for buffer. Do note that there is no returning of unconsumed alcohol beverages. Orders must be placed at least 5 working days prior to function date and is subjected to availability. Please call +65 8751 8740 for any last minute order. What is your serving size/portion? Food portioning is based on 500gm per pax (1:1) with an additional 5% food buffer. A 2 inch food tray can contain food for 40-50 pax and a 4 inch food tray can provide for approximately 100 pax. Do you provide disposable wares? Yes, our disposable wares are bio-degradable. There are last minute changes to my event. Can I amend my buffet order? Changes must be made within 36 hours prior to the day of event. An administrative will be applicable for any last minute changes. A 50% penalty charge will be imposed for cancellation made less than 3 days prior to date of event. How can I make payment? All payments can be made via bank transfer or cheque. Cheques must be crossed and made payable to “Singapore Management University Alumni Association.” Payment must be made within a month from event date. (Within SMU) For external, payment must be made on the event itself or the day before.